* Other popular brands are listed at the end for comparisons. * These are general sizes only. The barrel of any particular pen model may be much wider than the diameter at the threads or gripping section, or may taper to a much smaller diameter. * Please note that some pen models may not be available in oversize versions, depending on each particular design and availability of material. 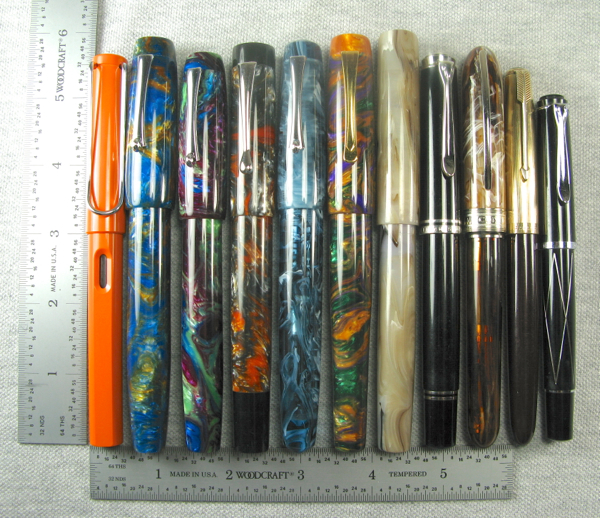 Left to Right: Lamy Safari, Balladeer – Large, Balladeer – Medium, Chronicler – Medium, Muse – Medium, Scribe – Medium, Edison Huron, Pelikan M805, Visconti Van Gogh Maxi, Parker 51, Pelikan M215.